And you can only get it if you are in France. I m not sure whether what are the conditions to purchase the unlocked version but it appears that Apple will indeed be going ahead with Orange in France to offer unlocked iPhones (as per French law requirements). The French law prevents carriers from tying handsets exclusively to their networks - consumers have to be able to move to a different network provider and take their phones with them. However, there’s lots of questions. Who can buy the unlocked iPhone in France? 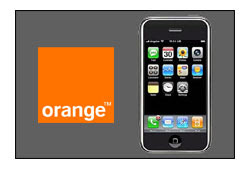 French citizen or resident or whoever who sign up with the Orange/Apple contract? I m sure the arrangement is a tricky one for Apple. What can it do to stop, say, British or German punters popping to Paris to pick up a SIM-free iPhone? Since its deals with O2 and T-Mobile are believed to be founded on taking a cut of the money the networks make from iPhone users, that's not an outcome Apple will be happy with. Move over all the iPhone unlocked softwares and cracks, here comes the cross-channel iPhone shopping trip.